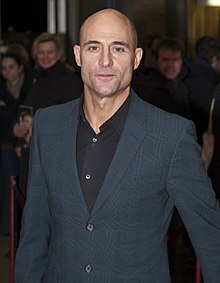 مارک استرانق (اینگیلیسجه: Mark Strong) بریتانیالی اوْیونچو. ۵ آقوست ۱۹۶۳ ‏ ایلینده لندن شهرینده دۆنیایا گؤز آچیب. اؤز تحصیلینی رویال هالووی بیلیم‌یوردودا بیتیرمیش. 1989–گۆنوموز ایللر آراسیندا سینما ساحه‌سینده چالیشیب. 1989 After Henry Roger Episode: "Wedding Bells"
1990 The Bill P.C. Gibb Episode: "A Clean Division"
1990 Inspector Morse Mike Butterworth Episode: "Masonic Mysteries"
1990 TECX Eberhard Braun Episode: "A Question of Chemistry"
1994 Between the Lines David Lacey Episode: "A Face in the Crowd"
↑ ۱٫۰ ۱٫۱ Loveredge, Lizzie (17 March 2000). A CurtainUp London Review, Speed-The-Plow. یوْخلانیلیب7 January 2017. ↑ ۲٫۰ ۲٫۱ Mark Strong and Hope Davis lead the cast of 'The Red Barn', a new play by David Hare. National Theatre (18 July 2016). ↑ Wolf, Matt (16 April 1998). Review: ‘The Iceman Cometh’. یوْخلانیلیب7 January 2017. ↑ Billington, Michael (18 September 2002). "Uncle Vanya". The Guardian. Retrieved 7 January 2017. ↑ Barnett, Laura (12 April 2014). "A View from the Bridge review – 'visceral and vital'". The Guardian. Retrieved 7 January 2017. ↑ Gardner, Lyn (17 February 2015). "A View from the Bridge five-star review – Ivo van Hove reinvents Arthur Miller". The Guardian. Retrieved 7 January 2017. ↑ "Olivier Awards 2015: full list of winners". The Daily Telegraph. Retrieved 7 January 2017. اینگیلیسجه ویکی‌پدیاسی‌نین ایشلدنلری طرفیندن یارانمیش«Mark Strong»، مقاله‌سیندن گؤتورولوبدور. ( ۲۲ ژانویه ۲۰۱۸ تاریخینده یوْخلانیلیبدیر). قارداش پروژه‌لرده مارک استرانق گؤره داها آرتیق بیلگی‌لر تاپابیلرسینیز. بۇ صفحه‌‌ سوْن دفعه ‏۱۳ مارس ۲۰۱۹، ‏۱۳:۰۰ تاریخینده دَییشدیریلمیشدیر.